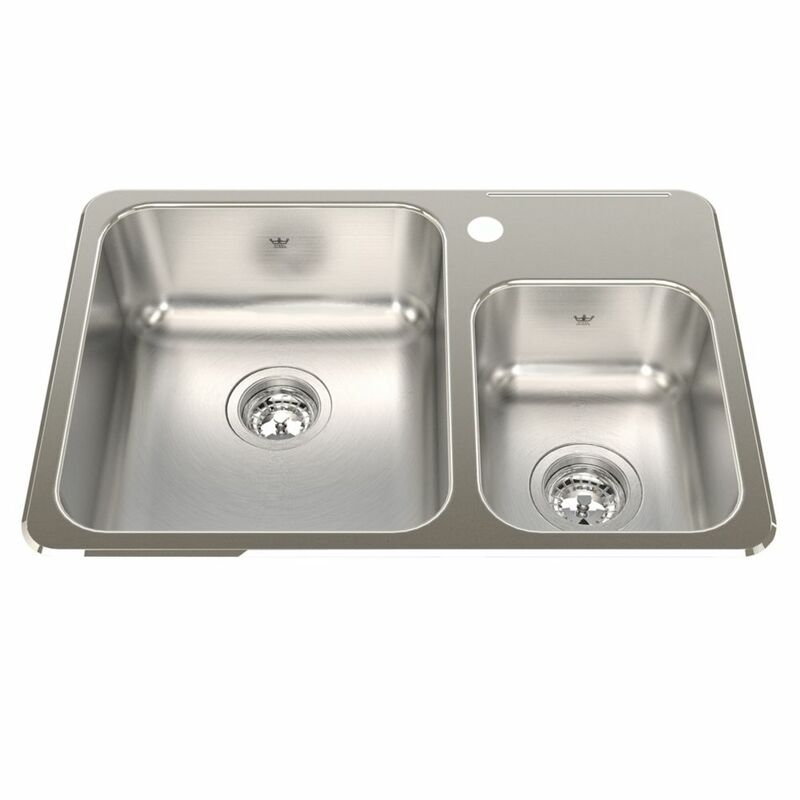 Kindred Combination 20 Ga sink 1 hole drilling - 18-1/8" X 26-1/2" X 7"
Combination bowl 20 gauge stainless steel top mount sink. Small bowl, right hand position. Includes faucet ledge with 1 one faucet hole drilling. Rear drain in large main bowl to allow for more storage below, easy care satin finished bowls and waste fittings. Sink is backed with a Limited Lifetime Warranty. This double bowl drop-in sink features 8-inch bowl depths and is made of 20 gauge stainless steel. Rear-positioned drain holes offer maximum usable bowl and cabinet storage space, while the deep recessed sink rim prevents spillovers. Models are available with 1, 3 or 4 holes in the sink deck/ledge. Available in store by Special Order Only. See associate for details. This single bowl drop-in sink features an 8-inch bowl depth and is made of 20 gauge stainless steel. The rear-positioned drain hole offers maximum usable bowl and cabinet storage space, while the deep recessed sink rim prevents spillovers. Models are available with 1, 3 or 4 holes in the sink deck/ledge. Available in store by Special Order Only. See associate for details. Combination 20 Ga sink 1 hole drilling - 18-1/8" X 26-1/2" X 7" Combination bowl 20 gauge stainless steel top mount sink. Small bowl, right hand position. Includes faucet ledge with 1 one faucet hole drilling. Rear drain in large main bowl to allow for more storage below, easy care satin finished bowls and waste fittings. Sink is backed with a Limited Lifetime Warranty.